Microscope slides-- These slides are hung on a line attached to the Dock at the upper end and held down by a weight at the lower end. The slides have small notches cut into the edge by a small file, and thin copper wire warped around the slide, using the notches to keep the wire from slipping off the slide. You can hang several slides on one line and retrieve them at different times. However, that confounds time with depth, so it would be better to hang several lines. You can also use other materials, e.g. slate, lucite, metal. 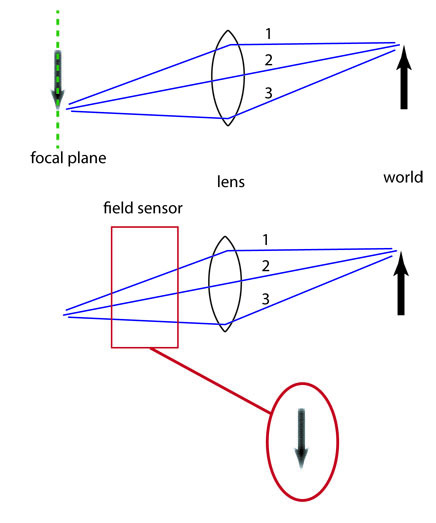 Focal planes-- The diagram above shows a series of images acquired at different focal distances (the red lines). The camera is moved down (or up) in a sequence, and an image is acquired at each position. Each image is then examined by a computer program which identifies areas that have sharp edges, and therefor must be in focus. The "in focus" areas are then merged to produce a composite "in focus" image. Sometimes this process can remove portions of the image where the animal was moving and replace with a section of another image where this part of the animal was still. The amazing thing (to me) is how well it often works! Of course it can't always produce the image you hoped for. Beyond focal planes-- Top panel: a conventional camera with light rays from an object (the arrow) focused at one plane (the focal plane). Bottom panel: the field sensor collects data on both intensities and directions of light. After computer processing an image is obtained with objects in focus at a user defined focal plane. The big picture-- Acquire multiple images, stich them together, and then look at the detail at your leisure. This essay is a bit of a grab-bag, but the sections all have something to do with getting good images of Life on the Dock. In "Life on the Dock", Chapter 10, page 68 I show a microscope slide that had been suspended into the water for about a month. A Botrylloides tadpole had attached and by that time had grown into a colony. Since the slide is transparent, I could illuminate from below and reveal some of the internal structure of the colony. In Chapter 13, page 100 I describe the use of microscope slides to study the events that must have occurred when the Dock was new. Again the slides were suspended in the water and after a few weeks were colonized by amphipods. In this case we could view the amphipod burrows from the underside, and see the inhabitants move around. Quite aside from the optical properties of glass slides, they provide a way to examine populations of relatively young animals and plants. The population on the Dock is generally old. Many have been there a year or more, and even the younger ones are growing on and under old individuals, which are often dead. Thus I urge you to look at slides suspended in the water to see the young. It also enables you to see the changes in colonizing organisms as the year progresses, and the varied zoo which attaches to glass at different locations among your docks. In producing dramatic images of marine life the number of pixels in the camera is usually not the limiting factor. More important is the the lighting and quality of focus. Good lighting produces good contrast, and contrast is what enables us to see the subject. Lighting depends so much on the particular object and your access to it that I can't make a good general recommendation, you just have to experiment. It is easier to make some general comments on focus. There are two barriers. 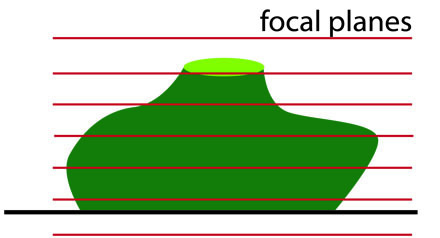 First, the focal plane of the camera may not be exactly the focal plane of the eyepiece objective. Good, i.e. expensive, microscopes are usually close to par-focal: the camera and the eyepiece have the same focal plane. But you may not have the best equipment, and even the best can easily get out of adjustment. Second, a given lens combination has a depth of fiel; a range of distances which are in focus. The depth of field is a little subjective, how sharp does the image need be to still be described as "in focus". A solution to both of these problems is acquiring a series of images at slightly different focal settings, and then selecting the one that is the best. However, this isn't effective if the object is large (thick) enough so there is no single position for which all the object is in focus. Both of these problems can be solved by acquiring a focal series, and using image software to merge regions of the series that are in focus. HelocionSoft sells just such software at a modest price. I have tried it and it does work! You can generate the series of images by manually increasing or decreasing the position of the objectives as you take a series of images. Some cameras have electrically controlled focus, and the Helicon software will create a regular series with no manual intervention. Cognisys-inc....... sells a computer controlled platform that carries a camera. It can be programed to acquire a set of images in which the camera has been moved a set distance between each image. As computers becomes smaller and cheaper a variety of innovations become possible. In the previous section I described selective merging of images by a desktop computer after they had been acquired by a camera, but what could you do with a computer in the camera itself? Actually all digital cameras already contain a powerful computer. Images are captured in raw format (a two dimensional array of intensities), but cameras can convert images to JPEG format, which takes up much less space in the memory chip, but contains most of the image detail. Conversion of raw to JPEG requires a lot of calculations! Capabilities that are available today are acquiring rapid sequential images, at reduced resolution, to produce a video. Another use of sequential images is to acquire just the right image in a very dynamic scene: you want an image of the soccer player as he kicks the ball, so you depress the shutter a second before that happens, the camera starts to acquire images for the next two seconds, and later you select the perfect one. Many scenes have regions of very bright and very dim light. HDR (high dynamic range) cameras rapidly acquires several images with different "exposure settings", then merge them to produce a single image, (look up HDR in Wikipedia). A more radical approach is now under commercial development by Lytro, Inc, in Mountain View, CA. They replace the traditional lens-sensor system that produces an image on a flat focal plane with a an array of micro-lenses that records the "light-field". The light-field is the intensity of light rays plus their directions, and thus contains far more information than just the light intensities at one focal plane. The data acquired makes it possible to produce an image in focus at a distance that is defined after the data has been acquired. Both HDR and light-fields are described in The Economist, pg....... 3-4, Sept 3-9, 2011. There are situations in which a good strategy is to acquire multiple overlapping images and analyze them later. You could call this the shotgun approach. It was effective in the Mars lander expeditions, where it wasn't time effective for the rover to take one image and wait days for the scientists on earth to determine if it was useful to zoom in on one region or move on the the next viewpoint. Rather, the camera collected a panorama automatically, which was examined in detail later. GigaPan sells a mechanical device which turns the camera in a precise sequence of angles to acquire a panorama. This is then stitched into a single image [Science 5 Nov 2010, vol 330, page 748]. I haven't tried this, but I think it would be great to acquire a giant panorama of a small area of the Dock, and then examine it to see all the inhabitants. Disclosure: I have no interest or investment in any company mentioned in this article.